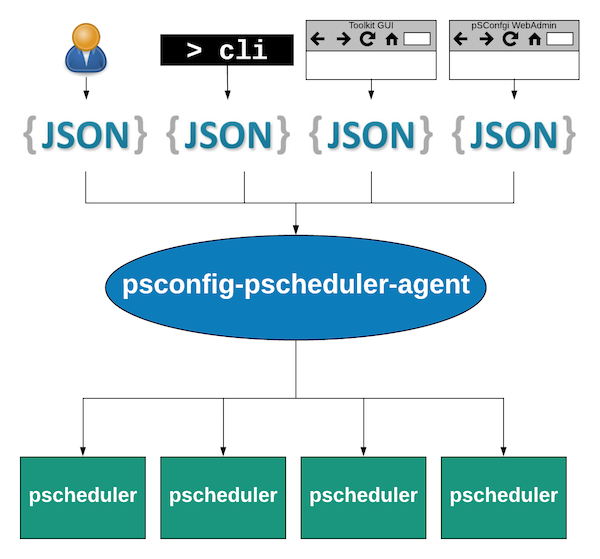 A diagram showing the psconfig-pscheduler-agent reading templates from a number of sources and submitting tasks to pScheduler servers. Within a configurable amount of time of a change to a local configuration file (changes to remote files are not detected). By default the value is 1 minute. Inclusion of default archives for all tasks. See Configuring Default Archives for more detail. Direct transformations to the template JSON. See Transforming Individual Remote Templates and Transforming All Remote Templates for more detail. By default, the agent detects the addresses on the local interfaces of the host which it runs. The default behavior can be overriden by setting the addresses option in the default configuration file. See Advanced Configuration for more detail. Once it has the list of addresses for which it is responsible, it is not just a matter of seeing if one of the addresses is in the generated address list for a task. Instead, it must also analyze if the address it matches is also the one designated to schedule the task. This designation is dependent on the task configuration. A full discussion of this stage of the decision process can be found in Controlling the Agent That Schedules a Task. Once the set of tasks that needs to be managed is determined, the agent must then decide which pScheduler servers to contact to make sure they are created. It does this by contacting a pScheduler assist server that will identify a lead participant. The assist server is a pScheduler server running on the local host of the agent by default, but this can be overridden. How the lead is determined is test plug-in dependent which is why the agent needs a pScheduler assist server to make the decision. A configurable fixed amount of time after the task is created. By default this is 24 hours. The length of time required to complete a configurable number of runs. By default the value is 2. See Advanced Configuration for more detail on the configuration options listed above. The task will be recreated after its expiration if it is still in the template. If at any point a task is removed, then the task will be canceled the next time the agent runs. The new task is actually put on the schedule several hours before it is set to expire, but with a start time that matches the end time of the old task. This should minimize any downtime between the transition but also prevent test collisions. When finished communicating with all the required pScheduler servers, the agent will remain idle until its next run. The psconfig remote command simply edits the /etc/perfsonar/psconfig/pscheduler-agent.json file. For most users it is recommended to use the psconfig remote command as opposed to editing the file directly as it is less prone to syntax errors. psconfig remote add --configure-archives "https://10.0.0.1/example.json"
The command accepts only a URL and will remove the agent’s pointer to that template. Within 60 seconds of executing that command, the agent will run and begin canceling any tasks from the removed template that it was responsible for creating. The psconfig remote command is also the command used by the MaDDash agent to manage remote templates. If you have both agents installed on the same system, then any psconfig remote command will affect both agents by default. If you’d only like a command to apply to the pScheduler agent then add the --agent pscheduler option. Run psconfig remote --help for full details. Files are read every 60 minutes regardless of changes when the agent checks on the state of the tasks it has created in pScheduler. Any archives defined for the tasks will be configured. This is equivalent to the behavior of running psconfig remote add with the -configure-archives option. If you do not want to use archives from the template, then remove them from the template file. The agent can modify all tasks it manages to include additional archives not defined in the templates themselves. This can be done by copying archive definition files to the archive include directory. The default location of the archive include directory is /etc/perfsonar/psconfig/archives.d/. Adding a new file, removing a file or updating a file within the archive include directory will get detected automatically by the agent within 60 seconds of the change (i.e. no need to restart the agent). Files are read every 60 minutes regardless of changes when the agent checks on the state of the tasks it’s created in pScheduler. The agent ignores any files that do not end in .json. Adding a new file, removing a file or updating a file within the transforms include directory will get detected automatically by the agent within 60 seconds of the change (i.e. no need to restart the agent). It is possible to make custom local modification to individual templates added with psconfig remote using the --transform option. This is useful if you do not want a script affecting everything read by an agent. Templates added using the template include directory cannot be transformed individually. An agent administrator can apply default transformations to them as detailed in Transforming All Remote Templates or make the change manually since the administrator presumably has access to the local template. psconfig remote add --transform "if .archives.\"example-archive-central\" then .archives.\"example-archive-central\".data.\"_auth-token\" |= \"ABC123\" else . end" "https://10.0.0.1/example.json"
psconfig remote add --transform @/path/to/esmond-auth.json "https://10.0.0.1/example.json"
In both cases you can run psconfig remote list to verify the transform is in the remote definition. One of the first steps to perform when debugging the pSConfig pScheduler agent is to get information about the last time the agent ran. A run in this context describes an instance when pSConfig downloaded all the templates it is configured to use, made any local modifications and determined which tasks that need to be created and/or removed from the pScheduler servers with which it interacts. As described in pSConfig pScheduler Agent’s Role, a run can be triggered by the passing of a set time interval (60 minutes by default) or a configuration file change. Agent Last Run Log GUID is a globally unique ID used to identify a run in the logs. You can grep the log files with this ID to get the information about a specific run. Total tasks managed by agent is the number of tasks the agent is responsible for managing. This is not necessarily the total number that were created the last run, but it is the number of tasks it is monitoring and managing across all pScheduler servers. From include files is a count of the number of tasks that come from templates in the template include directory. Directly underneath that is a breakdown of the task count by the file from which they originate. From remote definitions is a count of the number of tasks that come from URLs added using the psconfig remote command. Underneath is a breakdown of the task count by URL. Is it managing the tasks I expect it to manage? This list includes all the tasks it manages, not necessarily the list created by the last run. It also does not guarantee that they were successfully scheduled in pScheduler. What it does provide though is the agent’s perspective on the tasks that it tries to create and maintain. Matching this list to what is actually in pScheduler is often crucial to debugging and this command provides a view into the agent’s side of that information. The agent log lives at /var/log/perfsonar/psconfig-pscheduler-agent.log and tracks basic information about agent activity and any errors encountered. This is often the first log to review when debugging as it is not as verbose as the others and provides a quick summary of the agent’s actions. The task log lives at /var/log/perfsonar/psconfig-pscheduler-agent-tasks.log and tracks the pScheduler tasks the agent manages. This is where the psconfig pscheduler-tasks command gets the information it displays. This log is useful if you need to look at how pSConfig is defining tasks it gives (or tries to give) to pScheduler. The transaction log lives at /var/log/perfsonar/psconfig-pscheduler-agent-transactions.log and logs each individual interaction with pScheduler. Every request to list, create and delete tasks is shown in this log. Each line provides context such as the action being performed, the pScheduler server URL and the raw JSON sent/received from the server. This log is intended to be verbose and useful when intricate debugging is needed. All of the logs are designed to by highly parsable with fields in the form of key=value separated by whitespace. Every line has a guid= field with an ID unique to the run of an agent. This ID is consistent between log files and is incredibly useful for linking events seen in separate logs. The primary configuration file for the agent lives in /etc/perfsonar/psconfig/pscheduler-agent.json. Generally you should not have to edit that file directly, but if you are interested in the full set of options available, then see the schema file.